Join us on the beautiful Custer-Gallatin NF as we reconstruct the past! 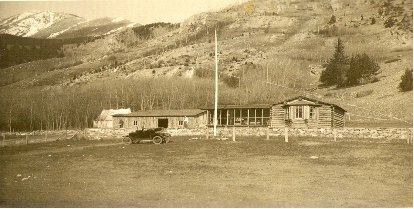 The 1905 Main Boulder Ranger Station is one of the early stations of the USFS. Its colorful history dating to the transition from the Absaroka Division of the Yellowstone Forest Reserve to the Absaroka National Forest is told in the house museum within the oldest structure at the Ranger Station. Unfortunately, the elements and the passage of time have taken their toll, and we need your help to restore this gem to its former glory! During the course of this historic restoration project, PIT volunteers and Forest staff will focus on re-roofing the shop and garage, and re-daubing the oldest structure. There are likely to be many other repairs we can squeeze in as well, so we will be dirty, sweaty, and busy, but, in the end, we will have made an incredible difference – one that you can proudly say you took part in! All meals will be provided, and evening presentations, hikes, and interactions with various local experts will be made available during those hours "off the clock." We hope to see you this summer!